The Big Idea: Recognizing and describing shapes is an important math skill. 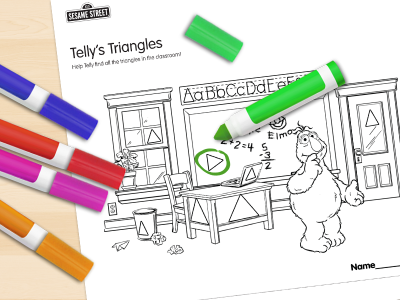 Ask kids to find all the triangles and color them in or circle them. Then count them together! Challenge kids to find other shapes in the picture, like squares or rectangles. Choose a color for these shapes.